Scroll down to view the document; press Ctrl+F (Windows) or Cmd+F (Mac) to search within the PDF file. Section of the Macksville Centennial Book dealing with Dilwyn. 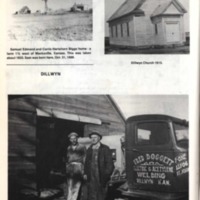 Macksville History Committee and The Lewis Press, “27- Dilwyn,” Digital Macksville, accessed April 22, 2019, https://macksville.digitalsckls.info/item/29. Samuel Edmond and Carrie Hartshorn Biggs home - a farm 1 1/2 west of Macksville, Kansas. This was taken about 1925. Sam was born here, Oct. 31,1889. Fred and Earl Doggett. Doggett Welding in Dillwyn. Lumber yard 1913 at Dillwyn.